Definition at line 24 of file CLLocalStyle.h. Definition at line 26 of file CLLocalStyle.cpp. Definition at line 34 of file CLLocalStyle.cpp. Definition at line 44 of file CLLocalStyle.cpp. References CKeyFactory::add(), CLStyle::createStringFromSet(), CCopasiRootContainer::getKeyFactory(), CLStyle::mKey, mKeyList, and CLStyle::readIntoSet(). Adds another key to the set. Definition at line 86 of file CLLocalStyle.cpp. Definition at line 70 of file CLLocalStyle.cpp. 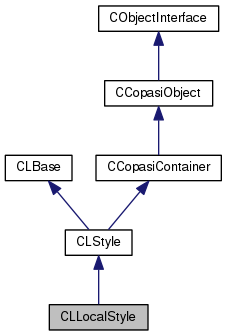 Referenced by SBMLDocumentLoader::convertLayoutObjectIds(), CLRenderResolver::fill_local_maps(), CLRenderFlattener::flatten(), and CCopasiXML::saveLocalStyle(). Returns the number of keys in the key set. Definition at line 54 of file CLLocalStyle.cpp. Checks whether a given key is in the role list. Checks if a certain key is in the set or not. Definition at line 78 of file CLLocalStyle.cpp. Removes an key from the set. Definition at line 94 of file CLLocalStyle.cpp. Definition at line 62 of file CLLocalStyle.cpp. Referenced by SBMLDocumentLoader::convertLayoutObjectIds(), and CCopasiXMLParser::LocalStyleElement::start(). Definition at line 102 of file CLLocalStyle.cpp. References CLStyle::addSBMLAttributes(), CLStyle::createStringFromSet(), mKeyList, and CLStyle::readIntoSet(). Definition at line 27 of file CLLocalStyle.h. Referenced by addKey(), CLLocalStyle(), getKeyList(), getNumKeys(), isKeyInSet(), removeKey(), setKeyList(), and toSBML().